Any client and CNET reviews can be found on insight.com product pages. Located with product overview and specification information, the ratings will help you make better procurement decisions. When logged in to your insight.com account, you can leave your own feedback on IT solutions you purchased from Insight. After selecting a product page on insight.com, scroll down and select the Reviews tab. You can choose to see both client and CNET reviews if they’re available. Under Customer reviews, check out average ratings and sort by most recent, oldest, most helpful, least helpful, most favorable or least favorable. While reading reviews, you can note if a review was helpful and report any issues you see, such as profanity. If you’re not logged in to your insight.com account, you won’t be able to submit a review. Select the Login option on the top right of your screen to access your account. Once you’re logged in, select the Leave a review button. In the window, provide an overall rating, title, review, nickname and recommendation, and agree to the terms and conditions. Keep the character counts below each box in mind as you enter your review. Submit your review once you’re satisfied with what you wrote. Q: Why can’t I leave a review? A: You can only review products available on insight.com when you’re logged in to your account. Once you’re logged in, a button will appear on product pages. You can click that button to write a review. Q: What is a nickname? A: A nickname is the username you choose to associate with your account. It will appear alongside the review. For privacy reasons, don’t use your full name or email address. Q: When will my review be published? A: After you’ve entered the required information and selected Submit, the review will be published within 72 hours on the product page. Q: Can I update my review after it’s submitted? A: No, you can’t update or delete your review. 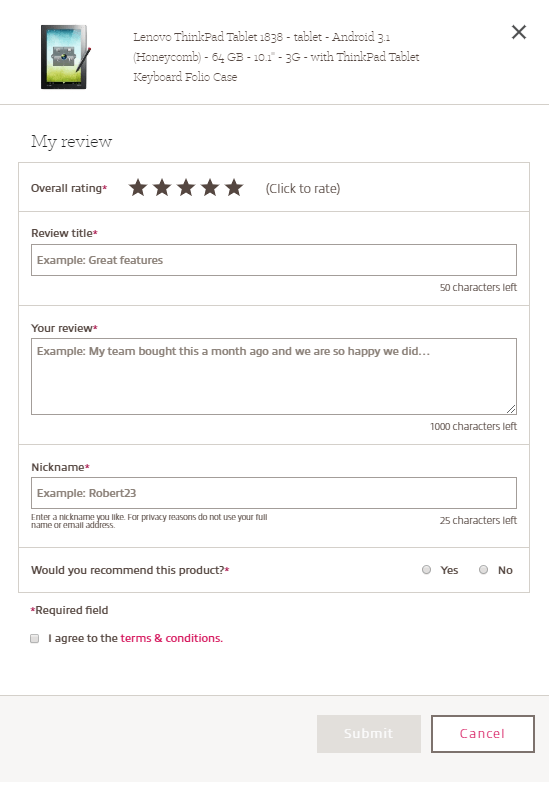 Submit a new review to add more insights from your experiences with the product. Q: Why don’t I see my review? A: Reviews aren’t published if they’re written in a foreign language or include profanity or personal information, such as names and emails. Q: Why should I report a review? A: A review should be reported if the text describes another product, or if it contains any information that may be seen as offensive, such as inappropriate slang. Near each review, select Report an issue to start the process. You can log in to your insight.com account to leave reviews on products. And explore reviews others have left. Don’t have an account yet? Sign up for free.